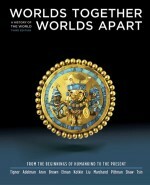 Worlds Together Worlds Apart. A History of the World. From the Beginning of Humankind to the Present [3rd ed., 2010]. Book abstract: « The most global approach to world history, now more streamlined and accessible.Worlds Together, Worlds Apart is organized around major world history stories and themes: the emergence of cities, the building of the Silk Road, the spread of major religions, the spread of the Black Death, the Age of Exploration, alternatives to 19th-century capitalism, the rise of modern nation-states and empires, and more. In the Third Edition, the text has been compressed and streamlined to heighten emphasis on world history stories and themes throughout. With chapters by: Robert Tignor (Author, Princeton University), Jeremy Adelman (Author, Princeton University), Stephen Aron (Author, University of California, Los Angeles), Peter Brown (Author, Princeton University), Benjamin Elman (Author, Princeton University), Stephen Kotkin (Author, Princeton University), Xinru Liu (Author, College of New Jersey), Suzanne Marchand (Author, Louisiana State University, Baton Rouge), Holly Pittman (Author, University of Pennsylvania), Gyan Prakash (Author, Princeton University), Brent Shaw (Author, Princeton University), Michael Tsin (Author, University of North Carolina at Chapel Hill).